The bedroom of the Cody-McCausland house, restored by the National Society of the Colonial Dames in Iowa, is part of the frame construction added to the stone building by the McCauslands, who were the owners after the Cody family left Iowa. In restoring the physical structure of the room, research indicated that the ceilings were white washed, and that the wood was grained to resemble oak. These features have been restored to their original condition. Before restoration, fragments of original wallpaper were found adhering to the walls, indicating the use of a vertical floral striped paper. Thus a similar reproduction wallpaper of the time has been used. In line with the 19th Century passion for patterns in all furnishings, a floral print was selected for the window curtains. The lace curtains, used not only for decoration, were utilitarian in that they kept out insects before window screens came into use. Hand-painted window shades, a rarity today, but a very typical product of the 1870's, are installed in the McCausland bedroom. An antique Brussels carpet of the late 19th Century has been laid wall-to-wall in the bedroom, just as was done in the 1870's for both warmth and beauty. 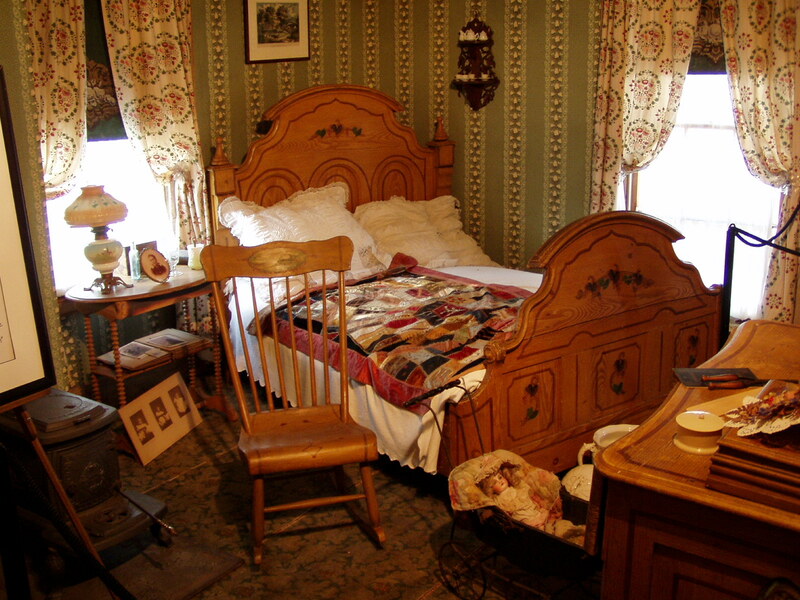 The bedroom set of "cottage" furniture is a fine example of the grained and stenciled pieces common in the Midwest, when the McCauslands lived in the house. On the bed, hand-woven sheets, a hand-woven blanket, a while Marseilles spread, and a silk patchwork quilt make for a "lived-in" look, which the Colonial Dames have worked toward in this preservation project.